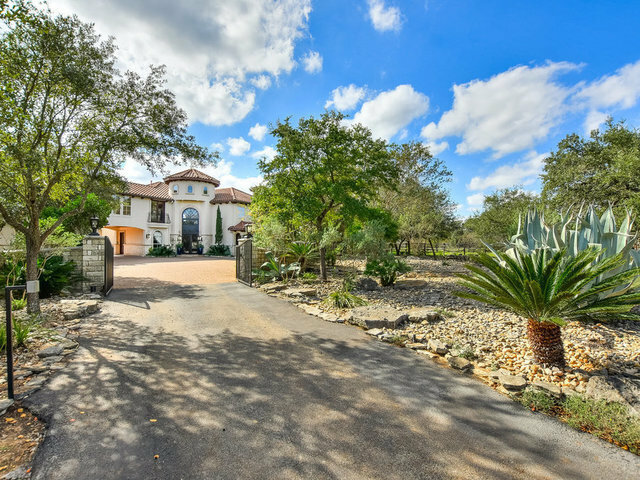 Reminiscent of the hills of Tuscany, Diamond K Ranch is situated on 40 peaceful acres just outside the artist and musician enclave of Wimberley. This special property showcases the Texas Hill Country at it’s finest: views for miles, the perfect combination of home and outbuildings and easy flow from indoor to outdoor spaces. Abundant architectural details are the centerpiece of Diamond K. From the grand turret entrance to the travertine staircase to the rustic beam ceiling, this home is striking yet livable. Soft lighting compliments the detailed mill work, hand-crafted iron accents, custom mosaic tile designs and woodwork graced by a fine artist’s hand. With the resort-style pool and spa, Hill Country stone benches, cooking and gathering island and fireplace, the adjacent outdoor space is a destination in itself for guests as well as homeowners. The breathtaking grounds are surrounded by a backdrop of rolling views and old-growth native foliage. A stroll through the property highlights nature of all sorts: quiet punctuated by chirping birds, running white-tail deer and the watchfulness of alpacas. A sprawling fenced garden is ready for planting while three outbuildings provide numerous possibilities for living, recreation and working. Diamond K is a place where dreams can be realized: the dream of a country retreat, the dream of an animal sanctuary connected to a graceful home, the dream of a heavenly wedding and event venue.